90 minute ride from Cancun. We suggest pickup at 8AM - 9AM. 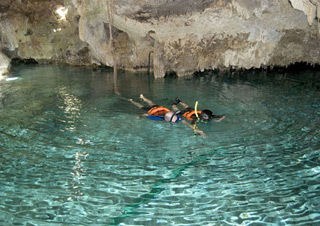 You go directly from your hotel to Aktun Chen Cenotes. Private tours are for your group only and therefore you plan the day. Insect repellant, bottle of water, swimsuit, towel, sunblock (biodegradable), hat, sunglasses, camera. Make sure to bring a change of clothes as the driver will not let you in the vehicle if you are wet.